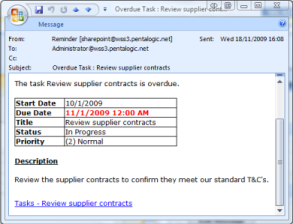 A new version (1.9.6) of Reminder for SharePoint which enables date based email Alerts is available. The main change in this version is to make it compatible with Google Chrome v37. Controversially Google removed a feature (showModalDialog) that has been included in most browsers since 1994 and is still part of the latest HTML5 specification. Improved compatibility with custom master pages or other controls that use jQuery and the ability stop reminder including jQuery on a page that already has it. (options under the Support tab). A correction to an error that occurred if you use List and View name with angle brackets in the title. To upgrade simply download and install the latest trial version – your license key will be picked up during the upgrade and all your settings will be saved. Warning – Once you’ve upgraded to v1.9.6 or above you can’t rollback to a version older than 1.9.6. Our PivotPoint web part for SharePoint allows you to summarise data from your SharePoint lists in a similar way to Excel’s Pivot Tables and Charts. A few users have asked how you can add highlighting or conditional formatting to the Pivot Tables – to do things like highlighting the High Risk column, or any cell above a certain value. If you’re looking for an easy way to add conditional formatting/ highlighting for SharePoint Lists then check out Highlighter. In SharePoint 2013 you can add a Script Editor web part (under Media and Content). This blog post walks you through. A much better way is to save the script as a .txt file in a document library and then include the file on the page with the Content Editors “Content Link” feature. Christophe walks you through this method here. You could adapt these ideas to run without jQuery if you like – but you’re on your own with that! You can see the reference to jQuery on the first line of the example scripts. a) Has jQuery already been added to all your SharePoint pages (by an administrator adding them into a custom master page)? If so then you should remove the jQuery reference from these examples as there is no point in including it twice. b) These jQuery files are loaded from Googles CDN servers. If you don’t have external internet access you will have to copy jQuery to some other location (such as a document library). Show me the examples already! .htm files that you can experiment with. Open them in a browser to see what they look like. Open them in a text editor like Notepad to change how they look and then re-load in the browser (F5). .js.txt files that you can use in SharePoint. The first example we’re going to look at is to highlight different cells depending on the value that’s in them. If it’s more than or equal to 180 then it should have a background in yellow. The result should be a web part like this. In this example we’re looking to highlight a cell based on what Row and Column it appears in. E.g. in this risk matrix we want to highlight the “High Risk” and “Frequent Probability” in red. The first is to highlight based on the position, e.g. Will highlight the cell in column 0, row 0 by setting the background red. (Yes sorry, the rows and columns start from number 0!). But – if the layout of your table changes in future (e.g. someone adds a “Super Extra High Risk”) column) then everything will move and this will be in the wrong place. In that case the better way is to highlight by the value of the Column and Row headers – e.g. You’re not just limited to setting colours, you can also add in any other effect possible in CSS. Use the developer toolbar (F12 in IE and Chrome) if you have an error – this tool will enable you to track it down, but how to use it is beyond the scope of what we can show here! A new version of our Reminder web part for SharePoint has been released (v1.7.16) that allows you to send email alerts if a document is left checked out for a long time. If you have document libraries that require check out before editing then you’ve undoubtedly been faced with the situation where documents have been left checked out – blocking other users from editing the document. Reminder allows you to send email alerts after a period of time to ensure checked out documents are not forgotten about. This example shows how to setup Reminder to send email alerts if something in a document library is left checked out for more than 12 hours. The manual contains other common scenarios such as email alerts when Task/Due and Overdue, simple helpdesk in SharePoint, enhanced SharePoint alerts and more. You can download and upgrade to the latest version. 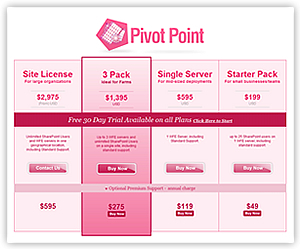 A new version of our PivotPoint web part for SharePoint (v2.2.3) is ready. This new version improves performance for large lists, corrects bugs when you have angled brackets (“<” and “>”) in your row or columns, adds support for site column lookups and a 2 new features. The new version of PivotPoint allows you to sort by both the Title and Total rows, either ascending or descending. For example, instead of sorting alphabetically by product you can sort by their total sales – showing your best performing products at the top of the table or left of the chart. In combination with sorting by the Total you can choose to show the Top N columns or rows. 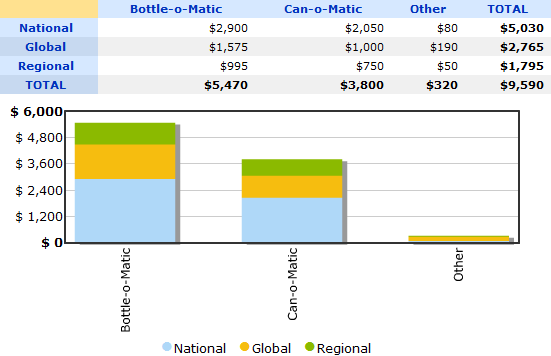 For example given the following data the vast majority of revenue comes from 2 products (Bottle-o-matic and Can-o-Matic) and we have a ‘Long Tail’ of other products. 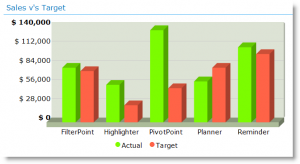 Show Actual v Target Performance in SharePoint with PivotPoint web part. So we all like to know how we are doing – hitting our targets, meeting our KPI’s, staying within our budgets, running out of vacation days. If you record things like this in SharePoint lists you would hope it would be easy enough to see how your actual performance compares to your targets, budgets or KPI’s. a Target or KPI – which is one item of data, which stays constant – no one likes a moving target do they? and an “Actual” figure which is the sum of a number of list items – sales, purchases, leave bookings, whatever, and which will clearly change as list items are added and changed. 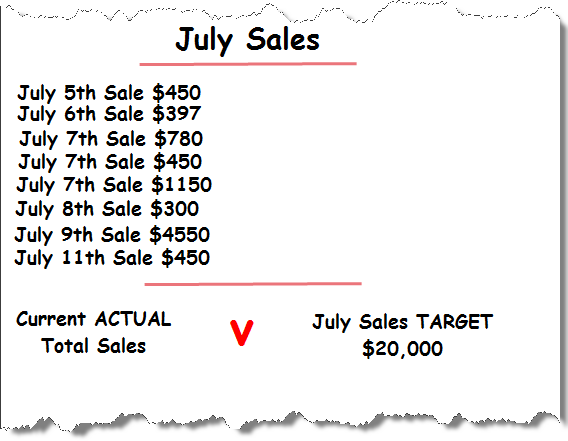 So if we were looking to compare Target and Actual sales for July, as in the chart above, the date would loook like this. A list of sales items, which will grow as the month progresses, producing a changing Actual total, and one Target item, which will stay the same throughout the month. These two data sets would generally live in separate lists. The way many KPI columns work is by getting you to manually enter – and manually update – your changing Actual total into your Target list. Not great, as you never get to see how the situation is changing until you have done your manual update. 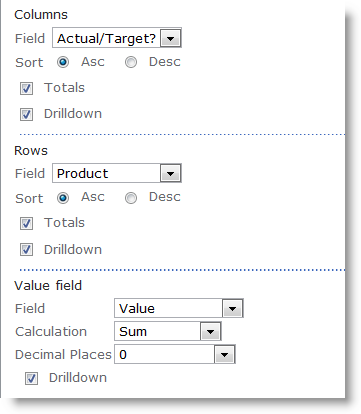 In a workaround for one of our PivotPoint customers we have turned this on method on its head – entering the static “Target” into the ~Actuals list (in this example the sales list) to allow you to produce a chart or table with our PivotPoint web part, which will show actuals vs targets and is updated as your actual data changes, without the need for manual intervention. Add a new column to your list. Make it a choice column with the choices as “Actual” and “Target”. Have it default to actual, as this is what the vast majority of items are going to be. Then we simply enter a “Target” item for each category we want to compare. 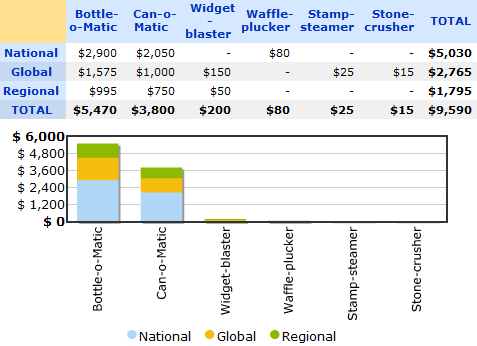 So in this example I want to see actual vs target sales for each of my products. So I have entered a Target Sales item for each of my products for July. As the month goes on my team will enter actual sales for July, which will (hopefully) start to stack up nicely against my target. So to see how things are shaping up set up a PivotPoint, get it to watch the sales list, and in this case a “This Month” view of the sales list. 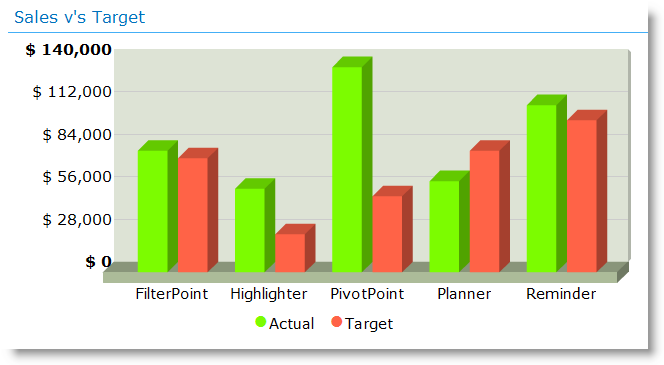 Display a Pivot Chart, in this case a column chart. Get your column data from the Actual/Target field. Your Row data from the product field. And your values from the Value field. And you should end up with a nice column chart like the one above. Woohoo – you can take that to the bank! So, it’s not perfect, it’s a workaround, but some of you might find it useful. Annual Vacation Allocation vs Vacation taken to date. If you have any other ideas on where this might be useful we would love to hear them. Remember the good old days, before SharePoint 2010, when a dropdown on the top right of a List View Web Part (LVWP) allowed you to select different views, quicly and easily? In SharePoint 2010 we have lost this handy feature. On some pages, a substitute does exist in the Breadcrumb on the title bar (which is part of the Ribbon, at the top of the page). It took us a little while to actually realize was there – but once we found it, it was very welcome. 3rd party web parts like our PivotPoint or FilterPoint tools that work really well alongside list views for creating dynamic dashboards. use your list on a wiki page – and remember most of the pages in SharePoint 2010 are wiki pages by default now. Also you don’t get it if you’ve created a new page and added a list view web part to it. Once it’s gone, you have to resort to the following ninja moves to change a view. 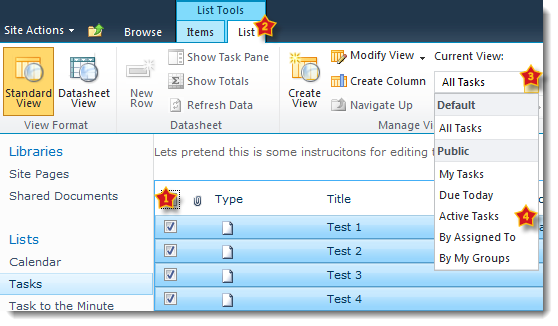 Select the list title (or something in the list) > List Tools > List, Current View dropdown > Then the view you want. 4 clicks? My finger is getting sore SharePoint! This bugged me so much that I decided to look into it further and ended up developing a little tool which – well – rescues the view selector drop down. FilterPoint Web Part – on sale now! After many months of work we are delighted to announce that FilterPoint is now available to purchase. Filtering is one of the things that any serious SharePoint user is going to need to do at some point. As you put more data into SharePoint lists become longer and you will need a quick and easy way to get to the items you are looking for. When you create applications and dashboards, bringing together information from different data sources and displaying it in different ways with Web Parts adding filters will make your applications and dashboards dynamic – giving users the information they need, when they need it. But when you start filtering you are going to quickly come across things that you wish you could do with SharePoint’s built in filters, but frustratingly just can’t. So in the same way that we built Reminder to improve on the functionality of SharePoint Alerts, and Planner to improve on Gantt charts and calendars, we have built FilterPoint to give a little more power to your SharePoint filtering. If you are working with SharePoint 2010 Foundation or WSS your filtering options are limited to static filtered views. Filtered views are great for getting at data sets that you want to see regularly – like “this month’s sales” for example. Set the view up once and it’s there whenever you need it. But what if you have 100 clients and want to be able to look at “this client’s sales” for any of them? Setting up a filtered view for each client, and navigating to it is going to be quite a drag. With FilterPoint your filter can be set up in seconds, allowing users to flip between the different data sets they need with just a couple of clicks. In 2007, send many filters to one filter consumer list or Web Part (e.g. filter on both customer and product). Clear filters with a single click. 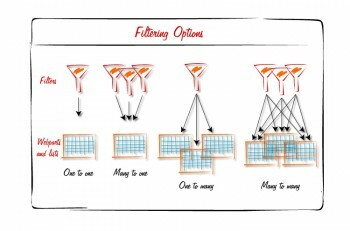 So even though MOSS offers more filtering options, there are still some significant gaps and we believe that FilterPoint goes a long way towards filling these. Of course FilterPoint isn’t the only 3rd party filtering web part on the market and you can see how we match up to the competition by taking a look at our comparison chart here. When we were looking at the competition one thing we noticed was that some of the most useful filter Web Parts – the ones offering the most functionality – were incredibly complex to set up. You would need the patience of a saint and a PhD in SharePoint (if such a thing existed!) So we have worked very hard to keep the setup of FilterPoint quick and simple. Take a look at our short on-line demo here, and let us know whether we have succeeded. We’ve also tried to keep the prices competitive. Our Single Server License is $595. And of course, like all of our products FilterPoint comes with a 30 day free trial and a no quibble money back guarantee. And for existing customers we are offering a 25% discount for purchases made by 31st March 2011. Email sales@pentalogic.net for your discount code. So why not give it a try today? As FilterPoint is our new baby we are very keen to know what you think of it – so please let us have your comments and feedback. If you have visited our website recently you may have noticed that we have changed our pricing. Just a quick note here to explain what we have done and why. Firstly we wanted to simplify the pricing of Reminder. People often commented on how confusing the licensing structure was with a combination of server licenses and web part license packs. So we have simplified this and also reduced the price, so that the price of Reminder now falls more in line with the pricing of other Alert enhancement web parts on the market. Across all of our products we have also introduced 2 new pricing options, which we hope will help to make our software more affordable for a lot of customers.